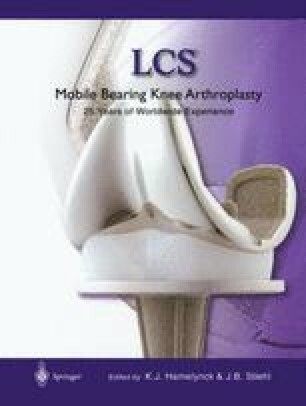 Improvements in total knee replacement (TKR) designs, materials and sterilization techniques during the past decade have led to improved clinical performance of these joints by reducing the prevalence of delamination and structural fatigue of the ultra high molecular weight polyethylene (UHMWPE) bearings. However, in the longer term, concern remains regarding the surface wear of total knee components as the generation and accumulation of micrometre and submicrometer size wear particles has been observed in tissues surrounding knee prostheses that were revised for infection in the early years of implantation . This may lead to osteolysis and long-term failure mechanisms similar to those found in total hip replacements . The generation of UHMWPE wear debris from articulating surfaces in knee prostheses is controlled by a number of factors. These include damage or scratching to the femoral and tibial counterfaces, kinematic input conditions (in particular the amount of internal-external rotation) and the design of the knee components.